The purpose of this note is to show how InfoSWMM is related to various SWMM 5 engines. 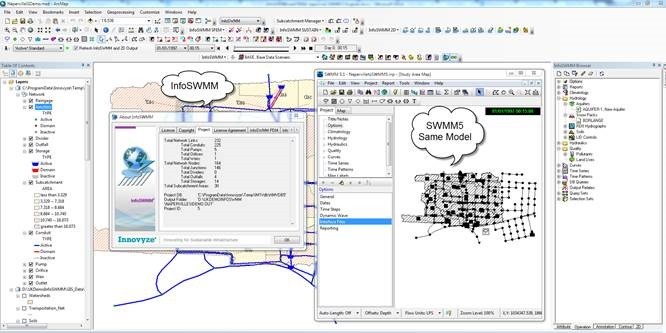 InfoSWMM is a ESRI Arc Map Interface to the properties of the SWMM 5 engine using model development tools created by Innovyze for InfoWater and InfoSewer. It uses a recompiled SWMM 5 engine for the purposes of integration with Arc GIS but the underlying engine code is the EPA SWWM 5 code. InfoSWMM has very good import and export tools for reading and writing SWMM 5 files. InfoSWMM does not have to be on the official FEMA list as it uses and exports the FEMA approved current SWMM 5 engine. SWMM 5 has been approved by FEMA since 2005. Figure 1 shows the versions of SWMM that have been approved by FEMA. It is approval that continues each time a new EPA SWMM 5 is released. 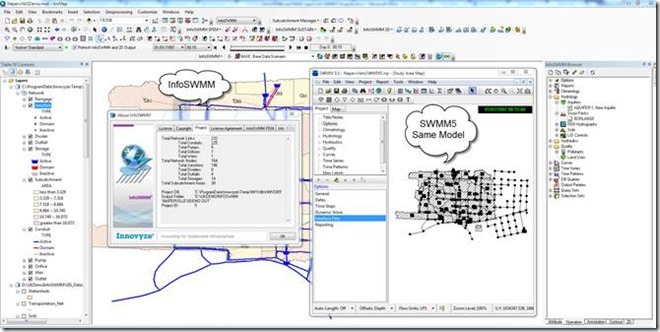 Innovyze InfoSWMM and H2OMap SWMM use a recompiled SWMM 5 engine based on the current version of EPA SWMM (Figure 2). The match between the EPA Engine and InfoSWMM is shown in Figure 2. EPA SWMM 5.x was produced by the Water Supply and Water Resources Division of the U.S. Environmental Protection Agency's National Risk Management Research Laboratory with assistance from the consulting firm of CDM Inc under a Cooperative Research and Development Agreement (CRADA) in 2004. Innovyze released the first version of InfoSWMM at the same time and keeps up to date with the latest SWMM 5 releases. The EPA SWMM 5 version used in the current version of InfoSWMM is listed at the top of the text output file (Figure 3). We will show in the rest of this note how you compare the InfoSWMM engine results to the EPA SWMM 5 engine results. There are many processes to compare: RDII, Runoff, Groundwater, Snowmelt, Quality, Routing (Figure 4). The InfoSWMM model is exported to SWMM 5 (Figure 5) with the message board showing any problems in the export (Figure 6). The exported file can be immediately imported into SWMM 5 (Figure 7). Any files created by InfoSWMM such as RDII, Runoff or Hot Start files have the same format as SWMM 5 and can be used immediately in SWMM5 (Figure 8 and Figure 9). The process flows are the same in InfoSWMM and SWMM 5 (Figure’s 10, 11 and 12) as the underlying engine is the same (Figure 13) for the compared model (see Figure 14 for a comparison view of InfoSWMM and SWMM 5). Figure 3 The Version of the SWMM 5 Engine Used in InfoSWMM is shown at the top of the Text Output File. Figure 4. The SWMM 5 Engine has many Processes as shown in this InfoSWMM Dialog. Figure 6. The InfoSWMM Message Board shows Any Export Messages. Figure 8. All Files Created in InfoSWMM can be used directly in SWMM 5 - it has to be the proper SWMM 5 engine corresponding to the InfoSWMM Version. Figure 9. All Files Created in InfoSWMM can be used directly in SWMM 5. This is the SWMM 5 dialog that is equivalent to the InfoSWMM Dialog. Figure 10. RDII, Runoff and Water Quality compared in the InfoSWMM Output (left) and SWMM 5 Output (right). The Process Values are the same. Figure 11 Groundwater, Flow and Water Quality Routing compared in the InfoSWMM Output (left) and SWMM 5 Output (right). The Process Values are the same. Figure 12 LID Process Components compared in the InfoSWMM Output top) and SWMM 5 Output (bottom). The Process Values are the same. Figure 13. InfoSWMM uses the SWMM 5 C code for the Current Version of EPA SWMM in a Recompiled C++ Shell. Figure 14. The Model discussed here has 232 Links. InfoSWMM (left) and SWMM 5 (right).